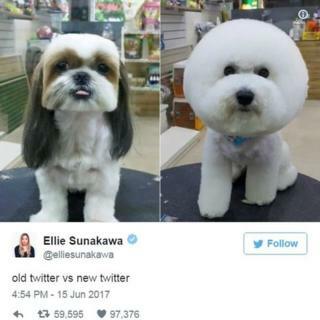 Not everyone takes kindly to change and when Twitter unveiled a surprise update to its website and app, its users were quick to mock the new look. As part of the redesign, profile icons are now round instead of square, the reply icon is reflected by a chat bubble, and likes and retweets are shown in real time in the app. Some people poked fun at some of the changes, while others lamented the update's lack of an "edit tweet" button. And several expressed the view that they preferred Twitter focusing on making the platform a "safer place to express yourself". A round Spongebob Squarepants made his Twitter debut with some images comparing "old and new" Twitter to a square and round Spongebob. Another comparison showed round and square designed toilets. The round profile icon also appeared to be problematic for accounts that had set their photos to the previous square icon, including the Twitter account for the video game series Minecraft. "Twitter's latest round update is clearly a war on Minecraft players everywhere," a Minecraft employee tweeted. One user pointed out that it had also taken US President Donald Trump's trademark hair from view. It also affected the profile icons of some media organisations: "Brands hating Twitter's design team right now...". But not to worry, BBC Breaking News has since updated its icon. A Twitter account for Lego Loki cut out his own new icon. One user suggested a new Twitter logo, featuring a much rounder blue bird. But some criticised the change, saying they wanted Twitter to focus on removing online trolls and "Nazis" from the platform. Misinformation and fake news has circulated on Twitter in the past, including following both the Manchester and London attacks. Coming to Twitter's defence, one user said it was at least positive that they hadn't introduced Stories. The Stories feature, a feed of videos and pictures in the top strip of apps, appears on Snapchat, Facebook-owned Instagram, Facebook Messenger, and WhatsApp. It was also introduced to Facebook in April and the internet went all out in poking fun at the news, rolling out Stories for everything.